American Parks Company - Smash Hit - Commercial Park & Playground Equipment for schools, churches, daycares, apartment communities, and more! This play structure will be a Smash Hit on your school, church, daycare, or apartment community playground. The commercial park and playground equipment provides 12 activities for as many as 40 children in the 5 to 12 age range. Single Speedway Slide for classic slide fun. Double Velocity Slide allows children to race side-by-side. An Apex Climbing Attachment with hand and foot holds for younger kids, and "tracks" for match-box cars down the side. Horizontal Loop Ladder overhead climber for upper-body strengthening. Leg Lift for improving leg and core muscle groups. A Drum Line, Whistle, and Rain Wheel for making all kinds of joyful noise. Moon Phase Panel and Gear Panel provide fun outdoor learning opportunities. A Crawl Tunnel for a unique way to traverse the play decks. A Fireman's Pole for a time-honored traditional way to get back to the ground level. ADA Transfer Station with Handhold for inclusive play. 3.5"O.D. x 12 gauge galvanized aluminum posts. UV Stabilized rotationally-molded plastic components for long term durability and fade resistance. According CPSC and IPEMA guidelines, every commercial play structure requires a safety surfacing material of some sort to be distributed according to its unique use zone. We offer several safety surfacing options, and will work within your budget to help determine which works best for your needs. Engineered Wood Fiber is the most affordable option, but also requires the most upkeep. Rubber Mulch is a loose-fill option similar to wood fiber, but due to its material properties requires much less maintenance over time, and it is made from recycled tires making it is a more sustainable solution. We also offer Rubber Safety Tiles, Poured-in-Place Rubber, and Artificial Turf surface options. Call us at 1-800-381-4491 and get assistance from one of our qualified playground experts. 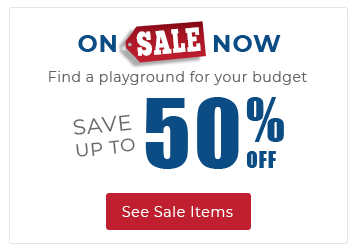 Ask us about our convenient playground bundle options, which include play structure, safety surface, free shipping, and turn-key installation services. 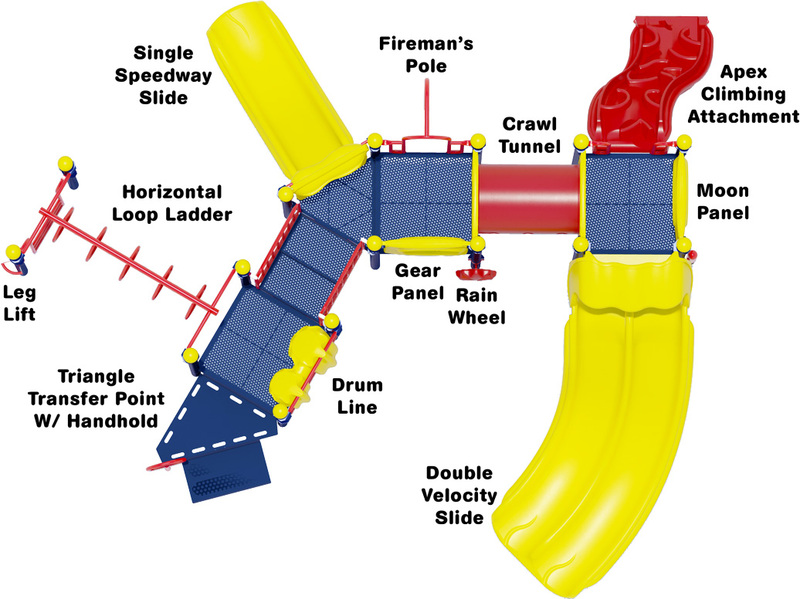 2 Slides, 2 Climbers, 2 Activity Panels, Crawl Tunnel, Fireman's Pole, Drum Line, and much more!